Last night officially kicked off the season glam, gown, and good times in “tinsel town” with the Golden Globes. Most of my friends share the fashion (of which there was plenty), the beauty, the hairstyles, and the moments. And I’m here for all of that. But I am a sincere fan of the speeches. I look forward to finding inspiration, social commentary, and the sound bites that become the source of memes and the infamous Black Twitter trends (insert sigh and eye roll to Jenna Bush Hager and her “Hidden Fences” reference). It’s not every day that Hollywood thinks of translating a play to screen. It doesn’t scream money-maker, but it does scream heart. It does scream art. One of the questions I am consistently asked is how to make a brand, business, event, blog, etc. “stand out.” I mean, I get it. There seems to an abundance of whatever type of industry you’re in–bloggers, YouTubers, authors, event planners, coaches, consultants, etc. And it can appear that we are all vying for the same audience, customers, clients, attendees, etc. But what I got from the quote from this quote and the success of Fences–a film critics were unsure about because they claimed plays didn’t translate well into film–is your heart is your art. What makes you stand out. And ultimately, what can make you money. The premise of the book “Purple Cow” by Seth Godin, is to find out what makes you remarkable. When you bring your H.E.A.R.T. to your brand, business, blog, or event, you can promise more, deliver the unexpected, and, above all, be original. You can discover and develop what is remarkable about you, your business, brand, event, or blog by asking yourself the following questions. What HELP do you provide? This is not the place for modesty or shyness. There is something that you do better than many others in the world. There is something that you offer or create that creates results, provides solutions, and produces satisfaction. For me, I have an ability to help people discover and become comfortable with what they were put on Earth to do. I help people work toward creating the life they want to have. I give them ideas of things to do that will create the life of purpose they want. That’s why they call me the purpose pusher. While I can (and do) teach and share on a lot of things, I am clear that this is ultimately my “sweet spot”–the help I provide. Write down 1-3 things that your blog, product, service, class, or content helps someone to do or with. What EXPERIENCES have you had that add to your EXPERTISE? Each of us brings a set of experiences to our life of purpose that no one else has. Two companies making the same product are still different because of the experiences and expertise they bring to the table. I see this definitely in the hair care and skin care industries–where I have acquaintances and friends. A lot of the reasons why they started their companies or businesses was because of the experiences they had (really the difficulties) that led them to create what they needed. You can do something very similar to someone else but it will still be different because it is YOU that is doing it. Why do you want to do what you’re doing? What experiences have you had that has given you knowledge and expertise in this area? What APPLICATIONS can people use for their life or business? I’m not necessarily talking about apps on your phone (although it may be). But “applications” also refers to the products, systems, products, processes, etc. that you create that help people with their life or business. What are the things you offer that people can use in their life and business? What RECEIPTS and REFERRALS do you have that will make people more comfortable working with you? Ultimately, many of us want to make money doing what we like and love. In order to create a higher level of comfort with potential customers or clients, you want to begin compiling your receipts. We keep receipts for tax purposes (I know, I know–I’m cussing at you LOL) to show that we actually did what we said we were going to do. The same applies for our businesses, brands, and blogs. When people start to see you do what you say you’re going to do, and people respond–they will gladly slide money their money right over to you. What have people said about you or your brand? What success stories have you had? What TOUCH do you bring that attracts your ideal clients or audience? Each of us has a way, style, swag, etc. with our brand or business. We each have our own personality or “touch.” And that touch is as unique as our fingerprint. That touch also invites your ideal client or audience to connect with you. Your “touch” will resonate with with some people–and not so much with others. But believe me, if you think in abundance–you will have more than enough people to serve. Don’t ever feel you have to alter your touch to attract your ideal clients or audience. That’s literally as painful as trying to change your fingerprints. What “touch” do you bring to your business? What is the unique mark you leave on your customers or clients? 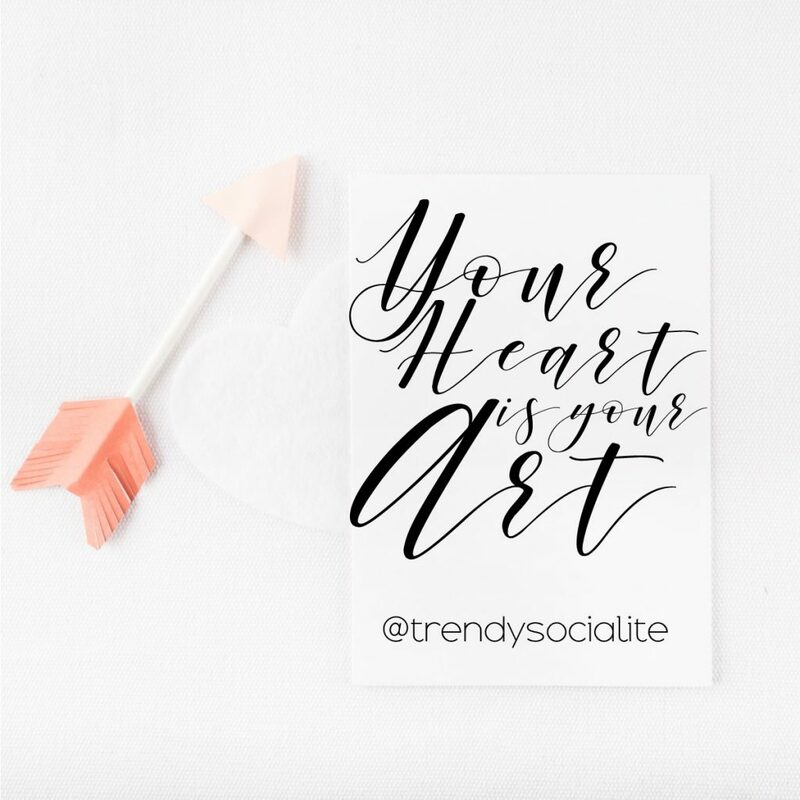 If you want to amplify your heart in your business, join the amazing TrendSetters Elite Inner Circle! It is a group of heart-centered women who have found and are continuing to increase the H.E.A.R.T. in their Art (their brand, business, blog, side hustle, etc.). Plus you get 1:1 time with me! When you bring your heart to your business or brand–it becomes a unique masterpiece of success and satisfaction!